Have you ever wanted to learn how to become a live casino dealer or perhaps enrol in live casino dealer school? If you answered yes to either one of these questions, then this article is perfect for you as we take a look at how to become a live dealer and what it takes to make it through live casino dealer school. What is a Live Casino Dealer? What are the requirements for being a live dealer? The very definition of a live dealer, or a dealer in a physical casino, is a human person who controls the game and awards winnings to players who win. 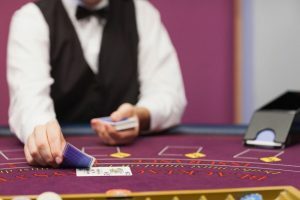 In an online casino environment, you can play fully automated games which rely on RNG or Random Number Generator technology or you can choose to play live dealer games which feature live dealers being streamed digitally to players and interacts the same way as if you were in a physical casino. Some players prefer to play with live dealers because of the comfort level they feel when dealing with a real person rather than an RNG system that happens behind the scenes and cannot be seen. If you want to become a live dealer, you should understand what they do and how important their role is within the casino. Live dealers act as an interactive go between when it comes to connecting players with the casino and they are also responsible for the smooth and error-free gameplay that we all have come to know and love. Most of the dealer’s’ responsibilities are the same but when it comes to being a live dealer, some of the responsibilities are a little different. For instance, money doesn’t change hands in a live dealer game but the live dealers are still responsible for overlooking and facilitating a flawless gameplay experience and in charge of bringing a social element to the game by interacting with players. In land based casinos, dealers are responsible for exchanging chips for money, paying players money owed in the right amounts, taking wagers correctly, inspecting cards for faults and announcing winners. This section is dedicated to outlying how to become a live casino dealer and look at what it takes to be successful in the post. The quickest and most popular road to becoming a live dealer is through a 4 to 8-week live casino dealer school course that is fully accredited by the gaming commission and designed to train and provide you with all the necessary knowledge required to be an excellent live dealer or a dealer based in a bricks and mortar casino. 2) Patience – keeping a cool head is crucial. 3) Sociable attitude – this is important when keeping players happy and making tips! To become a professional live dealer or land based dealer, you will have to know and understand the games inside and out. This is very important because you need to be aware of the rules and look to read player’s hands while knowing what to look for. You will also really need to love poker or other casino games due to the long hours you may be sitting at the table. Being aware of pot sizes and having a general awareness of your surroundings is important too, otherwise you won’t last long as a live dealer in the casino business, or even the live casino dealer school, for that matter. As mentioned above, the quickest route to becoming a live dealer is through a live casino dealer school. This route will allow anyone to learn how to become a live dealer by enrolling and completing a 4 to 8-week course. Live casino dealer schools are a great way to gain the necessary knowledge and training required to becoming a live dealer. Upon completion, applying for a position at a land based casino is the best way to put your new skill set to work. If you have experience either as a player or perhaps dealing experience elsewhere, then this application process should be easy for you. If you visit any local casino, you will be able to conduct an “audition” where you will deal a live game and the floor manager will watch you for 20-30 mins. If the manager likes what they see, you could be in full time employment in no time. As a casino dealer, you can expect to make an average salary and rake in some amazing tips on hot tables. On average, it is not uncommon to see $20-$30 per hour in tips and that is just on the lower wager tables. The high rollers have been known to tip anywhere between $100-$200 per winning hand. Being a dealer is considered being a part of a service based industry so the number of tips you would receive depends entirely on how the players feel about the service you present them.